There are lots of different discipline techniques you can use to guide your children toward good behavior. Learning about them is like stocking your toolbox for home maintenance. If your house has a good solid foundation, and you perform regular, routine maintenance, then you may not need to pull out your toolbox very often. But we all have those little repair jobs to do from time to time that require a basic, all-purpose tool, and some days we have really big issues that we need to pull out specialized power tools to address, and sometimes we even need to call in a professional to help. 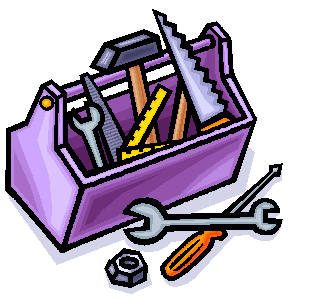 This post will orient you to all the tools in your toolbox, and help you figure out how to use the right tool for the right job, in the right way. Discipline means guidance. It means good modeling, setting clear expectations for how we would like our children to behave, not assuming that they know how, and setting clear limits about things they cannot do. And, it means that when they misbehave, we let them know that the behavior was not OK, but we do still love them, and we will tell them how to be better in the future. This style of discipline not only guides behavior, it also builds trust and respect between parent and child. Have snuggle time and special time and let them know that you love them. Talk and listen to them—build a “Love Map” of what’s important to them. Ask for respect from them and treat them with respect. Teach how to be good: talk about values; model, coach, and praise good behavior. Take care of yourself. Get the support you need in order to have enough energy to be a calm, thoughtful parent. Whenever possible, ensure your child is well fed and well rested. Avoid overstimulation (it leads to meltdowns). Spend time in kid-friendly environments where it’s easy for them to succeed. Set expectations: warn of transitions, and explain what the plans are. Use the Attention Principle: pay attention to positive behavior you want to see more of. Create a Routine to address any chronic challenge in daily family life. Clarify rules—your child may do something that they didn’t realize was wrong. You can explain what the problem is and how to avoid it in the future. For example, if you are often running late to school in the morning because your child is reading or playing instead of getting dressed, you could set up a routine by writing down what the steps are that they need to do, saying when you do these steps on time, then you can read your book, and giving them a reward at the end of the week if they’re on time every day. If the behavior doesn’t really break rules, but is just annoying, just Ignore it. Here’s a free printable set of discipline tool postcards to remind you of these. Give clear Commands. Make sure you have their attention first—connect to correct. Use eye contact. Don’t yell or whine: Speak with a calm, cool voice of authority. Let them suffer the Natural Consequences of their choices, and learn from their mistakes. These are your power tools. You’re not going to pull them out of the toolbox every day, but they’re there when you need them. You might use them any time your child is hurting someone or something or is at risk of being hurt. You might also use them for non-compliance – if you used the tools in the category above (telling your child what TO DO, given clear commands, etc.) and they continue to disobey, then these tools kick in. Use Time Out from Positive Attention. This gives them (and you) an opportunity to calm down. Seek peer advice, parent education, or professional support as needed. You may notice that I haven’t talked about one discipline tool: Physical Discipline. Many parents have discovered that, in the short term, spanking can be an effective way to get a child to stop doing something bad. But, in the long term, it can damage the relationship, cause fear and anxiety in the child, and teach the child that anger and violence are the ways to get things done. It also doesn’t teach them much about why the behavior is bad – they may avoid doing it when you’re around so they won’t get hit, but there’s no reason for them to avoid it when you’re not there, so they don’t gain self discipline skills. Read more on physical punishment and spanking here. Sometimes handling our child’s misbehavior can make us really angry. Look here for tips on “What if you’re angry at your child?“. When misbehavior stops, or after a time out or a consequence is complete, then re-engage with your child, providing positive attention and praise for good behavior. It’s especially important to do this if you got angry at your child. Read more about Resolution. discipline themselves. We want to raise adults who are capable of controlling their impulsive behavior, capable of working hard for a delayed reward (or even no reward other than their satisfaction with a job well done), and who have such a strong internal sense of right and wrong that it guides their every action, and who do what’s right simply because they can’t imagine behaving differently. Read more on self-discipline and how to begin to teach it. If you’d like a free, printable handout that summarizes all this information, just click here for the Discipline Toolbox in color or Discipline Toolbox, Black and White. This entry was posted in Discipline, Discipline Toolbox, Parenting Skills and tagged consequences, discipline, parenting, praise, punishment, rewards, time-out on December 8, 2017 by Janelle Durham.